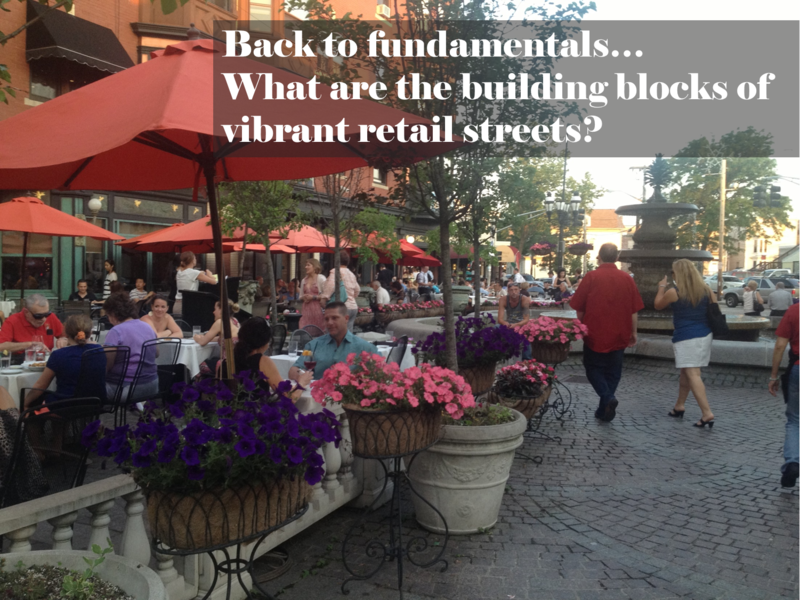 Back to fundamentals…what are the building blocks of vibrant retail streets? Figuring out what makes a great retail street is probably one of the most important research tasks in our field. This information allows us to make more informed decisions about which investments will create the most impact, and allows us to better advocate for policies that will make a real difference in the districts we serve. In 2012 the City of Washington D.C. commissioned a report to do just that. 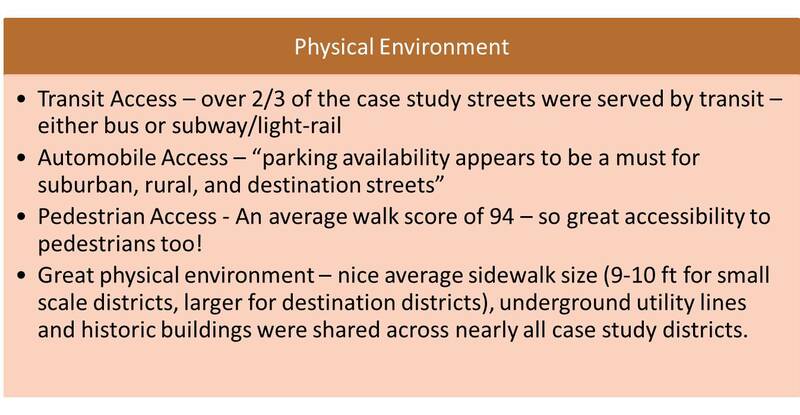 The DC Vibrant Retail Streets Toolkit attempted to unpack the elements of extraordinary retail streets. While the authors acknowledge that retail is too innovative to be formulaic in every situation, there were a number of findings that inspired us to take a look at how these building blocks reflected our own philosophy of what makes for great retail environments. 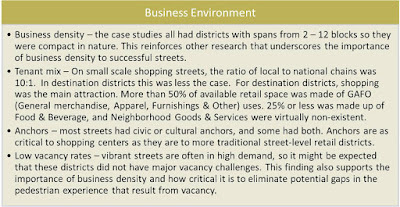 The study considered two kinds of retail streets – small-scale neighborhood streets and destination streets. 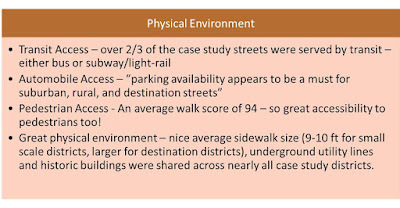 They then collected data for 16 case studies to see if the similarities could inform a set of policy and planning principles for the District of Columbia to follow. We took the liberty of organizing the elements into the assessment framework that we use in our work: Administrative Capacity, Physical Environment, Business Environment and Market and Demographic Data. of Small Business by our team on behalf of the Local Initiative Support Corporation. ADMINISTRATIVE CAPACITY: In our own research, we have also found that administrative capacity remains a consistent factor in successful retail environments. We we thrilled to see this study reinforce that finding. Again and again, studies into successful retail districts have consistently reinforced the importance of leadership and capacity to district success. 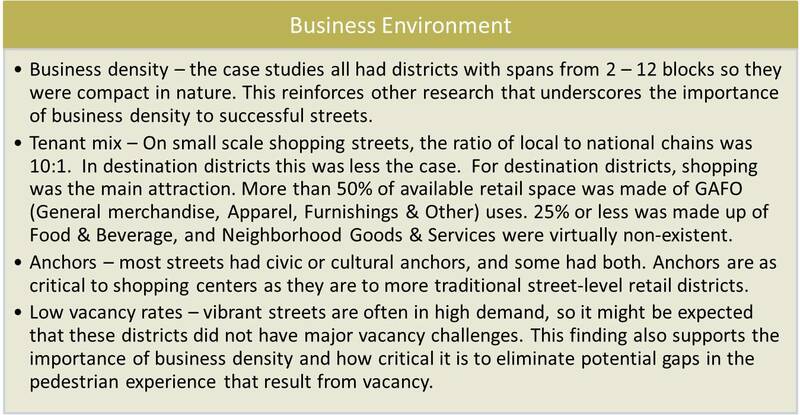 BUSINESS ENVIRONMENT: The vibrant street case studies that were considered in the study all reinforced the importance of market forces to great retail environments. Customers are driven to visit a place when the offerings are reflective of what they want to purchase and what they want to do. This is why a fairly tight node of great offerings, which should include a healthy mix of traditional retail anchors as well as non-traditional anchors such as civic and cultural institutions, is imperative to retail district success. MARKET/DEMOGRAPHIC DATA: The strength of the market – both from residents and non-resident visitors – is another key consideration. PHYSICAL ENVIRONMENT: And last but certainly not least, the condition of the physical environment plays a role. And our conjecture is that this will become even more the case as our retail environments are compete against on-line shopping options. It is the quality of the physical environment and the experience that the retail district offers that provides the most fundamental differentiation from the on-line experience. Districts that get this right are in good shape to ensure long term viability and vibrancy.